He is French, but he’s going to represent the Danish colors in Sydney later this year. 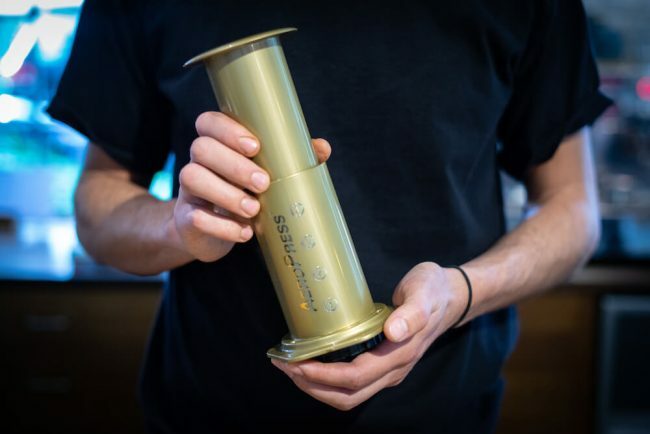 Here are Baptiste Fournier’s thoughts on winning the Aeropress Championship of Denmark. Baptiste Fournier from The Coffee Collective is the new Danish Aeropress Champion. 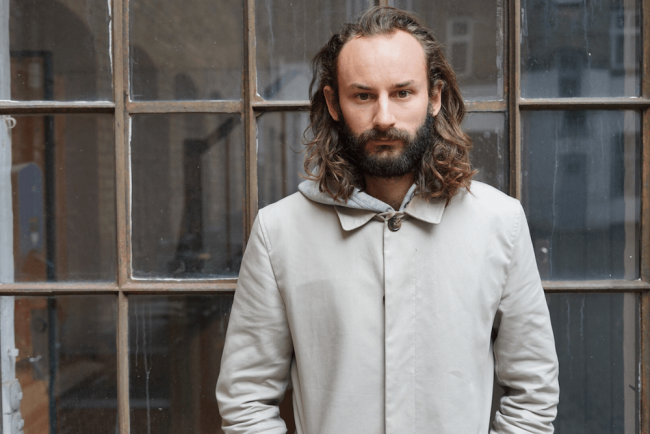 He took home the title after a day of intense steeping, flipping and pressing at Andersen & Maillard; a new coffee shop in the Danish capital Copenhagen. Now Baptiste is going to represent the Danish colors at the World Championship in Sydney later this year. Being French, it’s a slightly unusual situation for him. I reached out to the talented barista to hear more about his victory, and get him to reveal his best Aeropress secrets. Q: Hi Baptiste. First of all congratulations on the victory. Can you tell me how you prepared? Well, the rules only permit you to receive 250g of competition coffee ten days before the event. This coffee is all you have to practice with, so as you can imagine, things get pretty tight and you don’t have time for full preparation. For the competition, you don’t have to talk and explain what you’re doing, so it allows you to focus only on taste. The fact that you don’t have to prepare much is what makes this particular competition fun and accessible to anybody. The organizers of the World Aeropress Championships seem keen on retaining this vibe – energetic for baristas and engaging for spectators. For me, the competition was a platform to try a new recipe that I would not use under normal circumstances. Once I found the right ratios of water to coffee, I did a few trials with different grind settings, and that was it… I won! Q: You’re French but now you’re going to represent Denmark in an international competition. Are you going to do anything special to promote the red/white colors at WAC in Sydney? Well, I’m going for the Viking outfit but will press down my Aeropress with a baguette. Thoughts? Q: Are there any particular details in your recipe that make all ‘the difference’? I have used two paper filters instead of just one to get the cleanest result possible. When you use that amount of coffee in a cup, it can easily taste dirty and overwhelming. Q: Is there an Aeropress brewing technique you think is overrated? I don’t think so, and that’s why I like the Aeropress. It’s a brewing device that you could use as a regular coffee maker for your everyday coffee; it works well with a pretty standard ratio (15g / 230ml), but you can also play around if you have a bit more experience and have amazing results in both cases. The method I used is known as the “bypass technique” which involves adding water to dilute a concentrate you make. You can also try different water temperatures, ways of stirring or pressing that will all affect the flavors. The best coffee is the one that works for you! Use two (!) paper filters. Q: Where’s the most unusual place you’ve brewed an Aeropress? In Bali! I was in a tin shed surrounded by jungle and ocean. Surfers were catching the first waves of the day. Oh my god, I’m re-reading this, and it sounds fake and probably like the perfect instagrammable picture of an Aeropress but believe me, it was real! Q: What’s your favorite bean from The Coffee Collective’s current line up? That is a tough one, but right now my favorite in our range is the Kieni from Kenya. I enjoy the high acidity that the SL28/34 has to offer, showcasing very well that coffee is a fruit. I know that this coffee has been an eye-opener for many people. It’s one of the coffees that we have been continuously buying for the past nine years. It’s this long-term relationship that allows us to have a closer look at the quality on the farm level and keep improving from year to year. To me, that relationship has much value, and it’s one of the reasons why I picked it as my favorite. That being said I’m of course a big fan of Geisha especially both natural and washed from Hacienda La Esmeralda. Q: What’s your opinion of the Danish coffee scene at the moment? I think it’s growing slowly but at a healthy rate. The specialty coffee scene, in particular, is still pretty small compared to the size of the city. 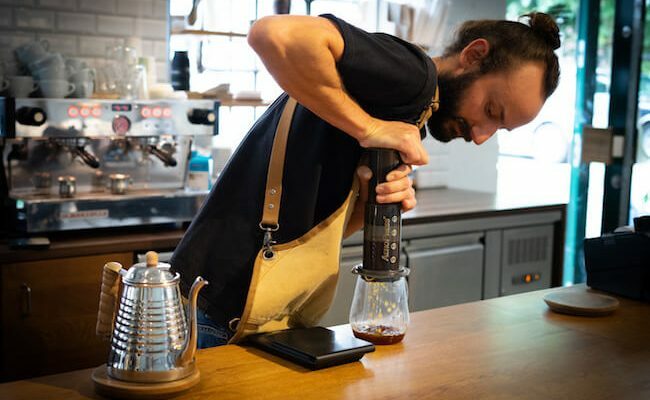 Being a big coffee consuming culture it’s taking time to change people’s perception of what coffee can be, but there are a few cafes opening that are pretty serious about it. Right now most of these are roasting themselves and have a different but distinct approach – it’s great to be a part of. Being French, I always tend to look at what’s happening in Paris. There are countless “third-wave coffee shops,” but a lot look alike and very few are pushing the limit of what coffee can be. Don’t get me wrong there is much good stuff over there too! That being said, I have only been in Copenhagen for three years, I’m looking forward to following the progression over the next three. A big thanks to Baptiste for participating. You can cheer for him and other aero-baristas at the World Aeropress Championship in Sydney the 17th of November.